The incursion by insatiable corporations into any part of the planet that appears to be profitable has brutally destroyed eco systems, wreaked havoc with wildlife and either slaughtered or displaced Indigenous peoples—all in the name of progress. Despite climate change deniers (some of whom who also sanction killings or, recently, state-sanctioned murder), if the world has much more of this sort of progress, the planet will once again go dark and shut down with no air left to breathe. In Brazil’s State of Mato Grosso (quite aptly meaning “thick bushes”), there is a section of the Amazon Rainforest that is under siege by the logging industry but one distant section that is—so far—off limits to the masters of deforestation. 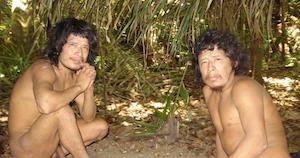 Within this protected area live two men: Parkyî and his nephew Tamandua. They are the last of Piripkura people to have refused to either be killed (“the natives hindered the country’s development—kill them” being the rationalization for massacre) or—like Parkyî’s sister, Rita—forced “across the river” and assimilated into “civilized” society. The opening part the production documents the attempts by Candor (at first, accompanied by Rita) and his crew to track down the nomadic men in order to give them a further two-year lease on their unique way of life. Given the climate and traditions of the Piripkura’s, the men wear no clothing and only require a “hatchet and fire” to live their lives as they always have. Candor is an expert in reading the telltale signs along the usual paths (footprints in the leaves on the forest’s floors, long-dead campfires—from which he can glean the cuisine consumed) and many abandoned tapiris—thatched-roof shelters that become the temporary homes of the pair as they move about their territory in search of food. Not surprisingly, it takes “third time lucky” to connect with the vigourous, amiable men but only because they have lost their fire and know Candor can be trusted to restore their “flame”. “The weather brought them to us,’” he remarks in a tone that speaks volumes about his previous tracking attempts. Next up is a “quick” health assessment (Candor uncategorically states to his colleagues that if Parkyî and Tamandua want to leave, he has no right to stop them). Awaiting the health practitioner’s arrival, the screen is flooded with images of the two men conversing with each other and Candor, all the while wearing FUNAI shirts, which, curiously, they look all “wrong” in. Who’s to say we MUST wear clothes? Capturing the obvious affection between the indigenous pair is one of this production’s finest achievements. Still, knowing they can’t reproduce definitely puts a time limit on their home being overrun by uncaring capitalists. Appropriately, much of the film has little dialogue, affording the cinematographers (Jorge and Dado Carlin) ample opportunity to let the stunning habitat (frequently doused by rain, of course) to silently make the point of what could be lost when “progress” ruins one of the last bastions of unbridled nature on the planet. Vitor Araújo’s original score—especially the use of the “old”-sounding piano—readily reinforces the artistic trusts’ intent.